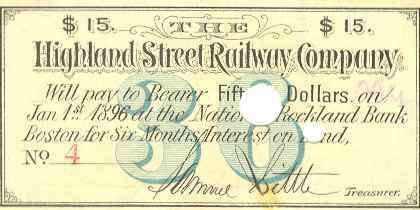 Images of bond coupons from early Boston transit companies. The Malden & Melrose and Highland roads were horse railways. The West End Street Railway was borne of several large horse railroads that consolidated together. The larger Boston Elevated Railway entity is a predecessor of the MBTA. Bonds are debt instruments. Money is borrowed from investors for a fixed period of time, and a piece of paper or bond is given to the investor to certify this transaction. Bonds once had a sheet of paper attached that had strips of coupons. The investor would cut out or clip each coupon and then redeem it at a bank or agent when an interest payment was due. The bonds matured (original investment returned) many years in the future. West End bonds outlived the original operating company by more than 20 years. The dates on the coupon represent interest payment dates.